I was in Los Angeles for a speaking engagement when three PETA employees approached me. One employee explained to me that animals don’t need to be suffering in order for him to be justified in killing them. He then explained that he has the right to round up and kill cats, even if they are not suffering, simply because he “believes” they might suffer. In fact, he said that no matter the circumstances, killing is not unethical—even convenience killing—because it is just like being put under anesthesia for spay/neuter, with the only difference being that the animal never wakes up. – Los Angeles, CA, March 13, 2012. I have long argued that although we have no definitive diagnosis of the condition which motivates the bizarre and cruel behavior of PETA’s founder, Ingrid Newkirk, there is one psychological condition which appears to shed some light on what might be motivating her to seek out and poison thousands of animals every year: Munchausen by Proxy Syndrome. This is the mental disorder that is responsible for nurses who kill their patients. Case history reveals that those who have been diagnosed with this disorder and who have been found guilty of murder show no remorse for their killing, arguing that their actions were motivated by mercy and compassion and that their patients, desperate to be relieved of their suffering, wanted to die. Because comments made by Newkirk when she describes killing animals mirrors this exact mindset, including stating that killing animals is a “gift,” and chastising No Kill advocates for “turning their backs” on animals “who want a peaceful exit from a cruel world,” I would be surprised if this doesn’t play a role, although—absent her submission to psychological testing—we cannot know for sure. We are left to speculate. But this much is clear: no normal, psychologically healthy person behaves in the manner which she does, so Munchausen by Proxy or not, I have to believe there is some yet undiagnosed malady that is to explain for what in practice expresses itself in an unrelenting thirst for the killing of animals which thus far has claimed the lives of more than 25,000 animals—a thirst that is made legally possible through her association with PETA. Not only does PETA’s registration with the State of Virginia as a “shelter” give her the ability to acquire the controlled substance fatal-plus which she and her staff use to poison animals, but being registered as a “shelter” with the State of Virginia allows Newkirk and her staff to mislead people into believing that the killing that they do is consistent with that being done by shelters, a form of killing which, tragically, has long been tolerated even by people who claim to love animals. Were Newkirk to independently—without a staff and organization to back her—seek out thousands of animals a year by lying to people, answering free to good home ads, taking them from rescue groups and shelters, gathering animals through trapping, or acquiring those displaced by natural disasters, only to inject them with poison and kill them—it would be immediately obvious to everyone that she was a deeply disturbed woman inflicting cruelty and death upon animals in obedience to dark impulses. Widely regarded as an organization dedicated to protecting, rather than harming, animals as is really the case, PETA provides Newkirk not only the perfect cover for her nefarious agenda, but, paradoxically, the perfect place to recruit others to participate in her depravity as well. 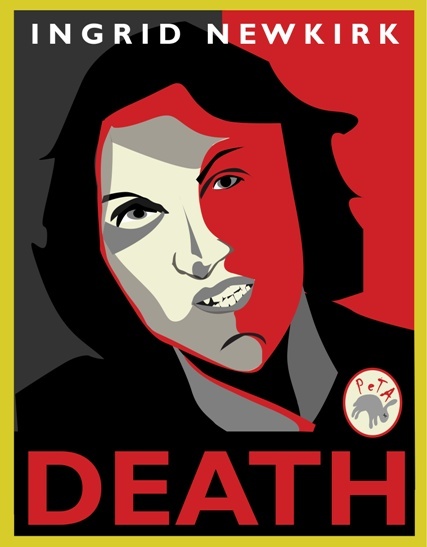 With the stamp of legitimacy her association with PETA affords her, Newkirk has not only been granted the unrestricted ability to kill without the scrutiny or condemnation of many so-called animal rights activists who grant her absolution, but it has given her easy access to naïve and easily manipulated young people who arrive on PETA’s doorstep starry-eyed, desperate to fit in and looking for approval. And somehow—exactly how we have yet to discover—Newkirk manages to transform at least some of these people into mindless drones incapable of critical thinking who not only defend the right to kill animals with the same, deadly language that she does, but who also seek out, then kill, animals themselves. The PETA employees who were found tossing garbage bags filled with the bodies of dozens of dead animals into a supermarket dumpster in North Carolina in 2005 are examples of two such people who have succumbed to and internalized Newkirk’s deranged thinking; and, after my encounter this week, I have to believe so are the three young PETA employees who showed up at a lecture I gave on Monday night at UCLA Law School in order to challenge me, and in the process revealed views about killing animals that left me not only deeply unsettled, but, I must admit, a little bit shaken, too. After years of knowing that PETA kills animals, lies in order to do so, calls for the wholesale extermination of feral cats and pit bull dogs, and works to derail shelter reform efforts nationwide, you would think that there is nothing I could learn about PETA that would have the power to shock me. But you’d be wrong. Because the attitude expressed by the PETA employees I met Tuesday night was clear evidence that PETA followers are not just parroting Ingrid Newkirk for a paycheck; they are, in fact, fully indoctrinated true believers—immune to logic and reason—that animals want to die. I was in Los Angeles for a lecture I gave to UCLA law students, followed by a public seminar on reforming animal control. PETA sent three employees—one man and two women. The exchange afterwards was truly surreal. It went like this: An unidentified individual shook my hand and asked to take a photo with me. I did. He then proceeded to ask me my recommendations about catching trap-shy feral cats for the annual veterinary checkups. I told him that I did not believe there was a need for annual veterinary check-ups for feral cats who were healthy. I explained that if a cat was injured or sick, there are ways to catch trap-shy cats and I gave him some examples. As we started talking, I noticed a woman was videotaping the exchange. I was then informed by others in attendance that the three were PETA employees. What transpired next makes me wish that I had been the one holding the video camera so that I could have captured, on tape, the bizarre and truly stunning statements in defense of killing animals that these people, in lockstep, repeated over and over again in spite of my attempts to have a reasoned dialogue based on the facts. During our discussion about feral cats, in which the man insisted that since feral cats were disproportionately suffering, they must all be rounded up and killed, I attempted to educate him that he had his facts wrong. I explained how it was never okay to kill an individual based on a group dynamic. I explained how even if it could be proven that 60% of feral cats die prematurely due to disease or injury (which is by no means no true, but postulated for the sake of argument), it would still be unethical to kill any individual cat because not only do that cat’s inherent rights ethically prohibit it, but you do not know if that particular cat will ever succumb to such a fate, let alone when. I argued that even if you knew that cat would get hit by a car two years from now, it isn’t ethical to rob him of those two years by killing him now. Furthermore, I argued, those are not the facts; feral cats are not disproportionately suffering. In fact, the largest study of feral cats conducted in the U.S. showed baselines of health and longevity similar to pet cats. And that’s when he stated that none of that mattered. It didn’t matter if animals were actually suffering before he had a right to kill them. He then explained that he has the right to round up and kill cats, even if they are not suffering, simply because he “believes” they might suffer. In fact, he said that no matter the circumstances, killing is not unethical—even convenience killing—because it is just like being put under anesthesia for spay/neuter, with the only difference being that the animal never wakes up. The conversation then turned to one of the women, who blasted me for supporting reduced adoption fees by shelters—something PETA publicly condemned recently when the Washington Humane Society announced their plan to do so in order to encourage adoptions and reduce killing. When I explained that there is no evidence to support her claim that reduced adoption fees leads to poor placements, she claimed that the evidence did not matter because her neighbor does not feed his dog. When I explained that while I agree we should not adopt out animals to people who do not feed them but that several studies have demonstrated that reduced fees increase adoptions but do not impact the quality or longevity of the home and that reduced adoption fees does not mean that we do not screen homes to prevent animals from going into the hands of abusers like her neighbor, she lashed out at me; repeating that because of what she sees when she looks out her back window, reduced adoption fees are a bad idea and animals are better off dead. And finally, the third PETA employee told me that pet overpopulation is real and responsible for shelter death rates. When I talked to her about supply and demand, the fact that 30 communities nationwide have ended the killing, and that the very existence of puppy mills (which I agree are abusive) proves homes are available, she said it didn’t matter, we just know pet overpopulation is real. So I asked her how she knew pet overpopulation was real in spite of the data and experience that proved otherwise, and she gave me the tautology that pet overpopulation is real because shelters are killing them, a logical fallacy, backward and circular reasoning, and a classic example of an after-the-fact justification. And so I was left to ask the only rational question such an irrational discussion could lead to. I asked them, “Where does Ingrid Newkirk find people like you?” And by “you,” I told them I meant unthinking people incapable of logic who are willing to embrace mass killing and even round up and kill animals because the Butcher of Norfolk tells them to. I was not trying to be ironic. How was it possible that there were so many people at PETA who are vegan, claim they love animals (they do not), but embrace the absurd notion that killing is not a moral issue if the killing supposedly does not involve pain? Moreover, people who embrace this idea even in circumstances where there is no justification other than a person believes it is ok because the animal “might” suffer, even in the face of all evidence is to the contrary that they are ever likely to? Given these beliefs, I wondered why PETA bothers advocating for a vegan diet. Since the only thing that matters to PETA is that the animals not feel pain when they are killed, why doesn’t PETA advocate exclusively for humane slaughter laws? Of course, as an ethical vegan myself, I know full well it is not only the method of death that is important; the killing itself is a violation of the animal’s most fundamental right. When Brazilian police were shooting homeless children on the streets of Rio de Janeiro back in the 1990s, it wasn’t wrong because they should have been injecting them with an overdose of barbiturates, instead. It was wrong because they were killing them. Yet, according to PETA’s illogic, it is the former reason which is the only thing that matters, while it is the latter that is the primary problem to all right-thinking individuals. If PETA is to be believed, so long as the cows and chickens (or children) are being killed “humanely,” it would be completely ethical to kill them. If PETA is to be believed, so long as hunters kill animals because they “believe” the animals might suffer, even if all evidence was to the contrary, that would be ethical also. Of course, none of these propositions are true, though they are compelled by PETA’s logic. But when I tried to discuss the logical implications of their viewpoint, they would have none of it, simply repeating, over and over again, without acknowledging a word I said, that killing animals is okay because they might suffer, and killing is okay because it’s just like going to sleep and never waking up. My head spinning, I left the event and spent the next several hours trying to understand the behavior that I had just witnessed. My research led me to information about how cults recruit and indoctrinate their members and I discovered that the behavior these individuals exhibited appeared to be a textbook example of that. Experts on cults report that they come in many varieties and sizes. There are religious cults like those founded by David Koresh and Jim Jones. There are commercial cults that recruit members to sell their products, thereby enriching their leaders. There are self-help cults which manipulate the emotionally vulnerable. And lastly, there are political cults which, according to one organization which tracks cults, don’t appear to be a cults at all; having, as their outer façade, “a slick well-rehearsed Public Relations front which hides what the group is really like. You will hear how they help the poor, or support research, or peace, or the environment.” And yet many of these cults are particularly scary because the harm they inflict is not limited simply to their membership. As with all cults, members of political cults become victims of emotional and psychological manipulation. They often live in desperate need for the approval of their charismatic and fearsome leader. But what makes political cults so particularly terrifying is that they often promote philosophies that endorse campaigns of extermination. Could PETA, which not only actively seeks out then poisons thousands of animals a year to kill, but whose legion of employees work to undermine lifesaving efforts across the country in order to sure that shelters keep killing animals, be just such a cult? After my experiences this week, I am beginning to wonder if PETA is not just “cult-like” as I have often stated, but, in fact, an actual cult. Indeed, I have often been baffled as to why PETA does not attempt to modulate its message in defense of killing and against the No Kill movement in light of our evolving success, continually hammering home, as they do, tired clichés and disproven dogmas that many savvy animal lovers are now too informed to accept. According to my research, information about how cults actually work sheds some light on why that might be: In a cult, “any information from outside the cult is considered evil, especially if it is opposing the cult.” Cults train their members to instantly destroy any critical information given to them, and to not even entertain the thought that the information could be true. Perhaps PETA employees cannot modulate their message in light of our success, nor can they internalize any information that disproves their assertions because they are incapable of digesting any information that conflicts with the PETA agenda in which they have been indoctrinated. As the employees I spoke to demonstrated, although they had just sat through a 2½ hour presentation debunking all their justifications for killing, my message had fallen on deaf ears that were incapable of hearing anything that contradicted the story line that PETA perpetuates and continually disseminates, including the myth that open admission shelters cannot be No Kill, the myth of too many animals and not enough homes, that feral cats are suffering horribly, that all pit bulls are dangerous, that any attempt to find more homes would put animals in the hands of abusers, and the most absurd of these absurdities, that killing is kindness, a gift. For every time I had attempted to break down for the PETA employees exactly where their information was incorrect—their insistence that open-admission shelters cannot be no kill, for example—by citing numerous animal control shelters nationwide that are, in fact, No Kill and open admission—or that pet overpopulation is a myth given that the number of homes that become available for animals every year vastly exceeds the number of animals being killed in shelters—the information simply did not penetrate. It was as though I was speaking a foreign language they could not understand; and in response, they simply kept repeating the same mantras over and over again: animals are suffering, killing is okay, and killing is a gift. In short, they were extensions of Ingrid Newkirk and entirely beyond the reach of reason. There is much we do not know about how PETA operates—how exactly it recruits people like the ones I met; how, exactly, it indoctrinates them into becoming killers. We do know that prospective employees are prescreened for their support of No Kill, and I personally know an individual who many years ago was fired from PETA immediately after saying that the video he was just shown that claimed No Kill resulted in hoarding and abuse was not correct, since he had volunteered at the San Francisco SPCA when it was the crown jewel of the No Kill movement and knew firsthand the high quality care it was offering. So we do know that if you really love animals, and you think for yourself, PETA doesn’t want you. Smart, authentic, animal-loving people need not apply. But, unfortunately, we do not yet have enough details to confirm the diagnosis of what, exactly, ails the leadership of PETA and the people who go to work there. But even if all we can do is speculate about the why and the how, we must continue to fiercely condemn the tragic and cruel outcome, regardless of its cause, in the hopes of bringing their terrifying death squads to an end. Because for all we do not know, this much is now certain: PETA is letting loose upon the world individuals who not only maniacally believe that killing is a good thing and that the living want to die, but who are legally armed with lethal drugs which they have already proven—25,000 times—that they are not adverse to using.